I’m a member of various Facebook groups (God knows what information they are collecting about me) and I notice lots of writers asking about joining critique groups and how they work. Keren David and I ran a Writing for Teens course at City Lit a while ago and developed some critiquing rules together for the workshop section of our first class. They must have worked because, two years down the line, that first group is still meeting. It helps that they are talented and dedicated of course. Anyway, I use the rules with all the writing workshops and mentor groups I run, including the Writing For Children workshop at City Uni. These are for people meeting face to face. I’m interested to know what rules have worked for groups that communicate mostly online. ‘Rules’ seems a strong word – but that’s what they are. It helps if everyone knows what’s expected of them. But if one of them wasn’t working with a particular group, I would change it. The group dynamic is what matters. Here are the 12. Let me know if you have different critique group rules of your own. Two, or max three, people get to share each time. Any more and the session is too long. Someone (me!) manages the rota to make sure everyone has a go. The word limit for a piece is 1500, but often it’s a bit less. If someone wants to share a longer scene or chapter in its entirety for a particular reason, they ask first and we see how the time goes. But 1500 words is a lot when you’re critiquing! We each have a printed copy in front of us. It varies as to who’s responsible for printing. Sometimes they’ve been circulated first and sometimes that’s not possible. Someone other than the writer reads out the piece. This was Keren’s idea and it’s my favourite one. The writer picks whoever they would like to do it, or someone volunteers. I think if you do nothing else, do this. As the writer, you learn as much from hearing your work read out by someone else as you do from all the comments. You can see what’s unintentionally confusing, and hear whether the rhythm and the structure works. You are forced to listen to it in one go (it’s not that bad, don’t worry!) without being able to tweak as you go – as you can with editing, so you get the chance to hear your writing voice properly. It’s a great discipline. There is a pause afterwards while everyone makes notes. We go round the group and everyone who wants to gets the chance to critique. If you don’t have anything to add, you can just say as much. Believe me that speeds things up and is so much better than simply repeating what’s already been said. Start with the positive, then move on to the bits you think can be improved. Really try to find that positive. We’re all sensitive artists, desperate for approval. We tried hard. We need it. Equally, there’s no point in just patting each other on the back. We’re there to get better, so insightful criticisms are useful. But try to limit it to three or four max. Nobody will remember a long list. Be brief, and make it count. Express your critique as your personal opinion and immediate reaction – which is what it is. Not ‘this is what is right and wrong and I’m giving you the benefit of my vast knowledge’. That just makes you seem patronising and lots of the group might be privately disagreeing with you. Unless you’re Stephen King or Neil Gaiman – in which case, fair enough. Probably. The tutor or mentor, if there is one, goes last. Which gives the opportunity to add things or if (as is often the case) the group has done a really good job of self-critiquing, we can merely highlight what we most agree with. Everyone, including the tutor, as an equal opinion. This is important too. There is no hierarchy of contributions. What matters is what inspires the writer to see what needs changing, and possibly how to do it. That could come from anyone. Equally, the writer does not have to take any of the opinions on board. He or she must listen, but that doesn’t mean he or she must act. You can quietly decide the group is mad and you hate all their ideas. But it’s funny what hits you later as more perceptive than it first appeared. For this reason, writers might comment on what really appealed to them if they like, but they can politely ignore what they don’t. There is no need to get defensive or argue. Just ignore and move on. The writer cannot say anything at all until everyone else (who wants to) has commented. This can feel extremely frustrating but it’s good discipline! It forces you to listen and not get into defensive mode. It helps you to see when someone didn’t understand your intentions, for example, and rather than simply explaining them then and there you can make a mental note to make them clearer in your writing. However, you can say whatever you need to at the end. I’ve just been looking through old blog posts I’ve written and came across this one, written in 2012 for Hay 25. It was published on the same page as one by John Finnemore, who is one of my writing heroes. Even though I didn’t encounter him in the green room or the bookshop tent there (damn), I had a wonderful, wet time and I think the blog captures it. Unveiling Venus came out last month. It’s the sequel to Following Ophelia and describes life as an unwilling artists’ muse in the macho, colour-drenched world of the Pre-Praphaelites. I’ve always wanted to write about art, having fallen in love with the Renaissance painters when I was a teen. That’s when I visited half the galleries in France and Italy, and I haven’t stopped. For the launch of Unveiling Venus I wrote a series of diaries about visiting some of my favourite haunts in London – on my own, with my youngest son, who is an artist, and with a friend. You can read about the trips to Pre-Raphaelites and the Opera: Passsion, Power and Politics here and here. Below, is my visit to Monochrome. Back again. I don’t actually come to the National Gallery nearly as often as I go the Tate, the V&A or the Royal Academy, but I like being influenced by friends and family, and what they want to see. It’s a chance to discover fresh artists and ideas that I wouldn’t have known about otherwise. And spend time with people I love. This time, my eleven year-old has shown an interest in the Monochrome exhibition that’s just opened in the Sainsbury Wing. He’s a good artist, preferring to work in black and white than to use colour, so this seems a great opportunity to explore artists who have thought likewise. Also, it costs an arm and a leg to live in London: we might as well take advantage of what’s on offer. Entry for this exhibition is free for eleven year-olds by the way, as it is to the whole permanent collection for everyone. I used to take this for granted, but visiting museums outside the UK, you quickly learn to appreciate the free access and lack of queues. We, the public, own much of this art. And we can see it whenever we like, for nothing. We wander around the early rooms, looking at paintings and stained glass for monasteries (the Cistercians thought colour could be too distracting) and paintings made to look like etchings for prints. It’s all very clever. We keep wandering. It’s not a large exhibition and soon we reach the room with twentieth century abstracts on the walls. One, by Bridget Riley, is like a horizontal bar code. Stare at it for a while and the lines seem to be moving. Another is a black square on a white painted square background. One of those ‘your 4 year-old could do it’ paintings. It was made in 1926. The note said the artist – a Russian whose name I forget – hung it up in the corner of the room, like an icon. And as soon as I read this I feel a meditative quality coming from that black square and its white frame. Are they a contemplation of life and death, and the divine? The squares aren’t quite perfect and that is part of the painting’s appeal. With abstracts like this, the beauty is in the detail. A simplified copy doesn’t have the same effect at all. If your 4 year-old created something so delicate and resonant – by accident or otherwise – she would show a hint of genius. So I follow him into the next and final room, where our eyes are immediately assailed by an oppressive yellow-orange light. It’s like walking around in a glass of bright, clear orange juice and I don’t like it. My son is beaming. ‘Look! Look at my t-shirt!’ I notice, before I do, that there is nothing on the walls in this room. No paintings or photographs. Something else is going on. Then I look at my son’s bright blue t-shirt – and it is grey. Or rather, he is all shades of orange, as am I, but without any other colour references, all my eyes pick out are differences in dark tones and light ones. My coat – hot pink – is merely ‘mid-tone’. We have become black and white. It’s disconcerting, but fun, now I’m getting used to it. Of course we take several selfies which I later upload to Facebook and Instagram. Fascinatingly, with the black and white filter on, the photos look as if they were taken on professional film, in a studio. This light has somehow sharpened our images. We go back to the previous room so my son can copy one of the paintngs for his sketchbook. When we re-enter the orange room it is full of sixth formers on a school trip, being strictly instructed to stop taking selfies and start taking notes. I pity them. All the art I’ve loved I’ve discovered in my own time and in my own weird way. Though my love of art did start on a school trip to the Tate, which I thoroughly hated. I took three postcards of Mark Rothko home with me that day to remind me how ridiculous his red and black abstracts were, and fell in love with them all within weeks. Their sadness and stillness spoke to me. I love them still. Today, the sixth formers have become the art. They are a black and white crowd in an orange filter. We are all strange and wonderful together. The world experienced differently – literally in a new light. The trip is worth it for this room alone. Of course we have a hot chocolate in the café too, and nip up quickly to catch my favourite of the National Gallery’s paintings: ‘The Ambassadors’, by Holbein, which looks like a perfectly normal Renaissance painting of two rich young men, until you notice the misshapen baguette lying awkwardly on a diagonal in the foreground, and stand at the side, as I was made to do when I was ten, and see, in a sudden shocking reveal, that it is a very large skull. These men, though they seem to have everything, will die one day, just like the rest of us. My son stares at the painting, confused, looks at me, looks back, sees it for the first time, and grins. Art as play. Art as discovery. Art as an in-joke, a meditation on life and death, a new perspective. Next on the list is a visit to the blockbuster Modigliani at the Tate Modern, on now (with a friend), followed by the blockbuster Picasso exhibition in the spring (with family). But an artistic adventure doesn’t have to involve the planning, queues and crowds of a blockbuster. Sometimes a room full of unexpected light can be enough. Good art shows us how to see the world in new ways, and in the struggling and divided societies we live in at this moment, we need it more than ever. Hi – and thanks for dropping by. I started this blog a long long time ago and there are many posts of it that capture my excitement at being a debut author and writing my first books. Do feel free to take a look and see what inspired me about fashion, pop culture and writing. But these days I teach as well as write and I have less time for blogging. If you want to know what I’m up to, you can generally find me on my website, my Instagram page or Twitter. See you there. On Tuesday I went to the launch for Tamsyn Murray’s Instructions for a Second-Hand Heart. It was a fab party in the stunning children’s department of Waterstones Piccadilly. Tamsyn explains how long the journey to publication has taken for this book – four years! So begins the Wikipedia entry for – up to now – arguably the greatest female gymnast in the world. I was 10 when Nadia Comăneci got her first perfect 10 on the uneven bars in the 1976 Montreal Summer Olympics. She was 14. It was one of those moments. A girl – like me – was the best in the world, the best ever, the best possible at what she did. (She went on to get a whole lot more perfect 10s. They had to change the scoring system.) No-one could ever take that away from me. Girls rocked. They were powerful. Even little, light girls, like me. They had hidden powers. 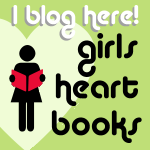 How about the rest of the Girls Heart Books site? If you look around, there may be lots to inspire you too.